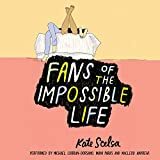 Fans of the Impossible Life deals with teenage depression, eating disorders, sexual identity, drug use, homelessness, foster homes, discrimination, homophobia, and suicidality. A lot of it is grim, but it is also about friendship, family, survival, tolerance, acceptance, and love. The story of the three 16-year-olds, Jeremy, Mira and Sebby, is narrated alternately by each of them, or from their perspective. Each has major problems, although it is soon clear that Sebby is at major risk, since he is not going to school at all, but is instead hanging out in bathrooms having sexual encounters with adults, while at risk of getting kicked out of his foster home, and has recently made a suicide attempt. Mira has problems with being overweight, but there are greater psychological issues behind that, because she hates herself. Jeremy is extremely shy and retiring. Mira and Sebby hang out together all the time. Jeremy and Mira go to the same New Jersey prep school, and at the encouragement of one of his teachers, he forms an art club. He asks Mira to sign the petition to create the club, and soon the three teens are close friends. There's sexual tension too: Sebby likes Jeremy, and Jeremy might be ready to return the feelings, but he and Mira also have some connection. So it gets complicated. There's a lot of drama, and it looks like it could get very serious. It's a complicated story, with a large cast of characters. There are plenty of revelations and crises, and things don't turn out well for everyone. The writing is compelling and there's enough energy here to keep the reader interested even when the going gets tough. There's humor and fun as well as gritty psychological pain. The unabridged audiobook has three different readers and they do well in their characterization of the teens, putting plenty of emotion and tone in their performance, which helps to get the plot details straight.